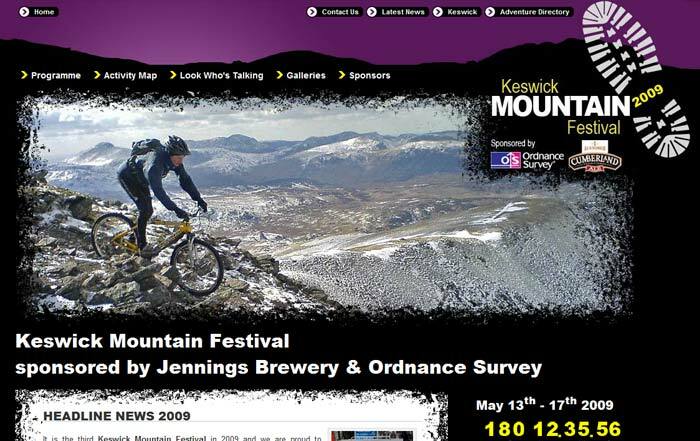 e-IGNiTION was originally invited to tender for the work to completely redesign the website for the Keswick Mountain Festival, and annual festival for outdoor adventure enthusiasts held in May in the Lake District. Competing against a number of web design companies based in the North West and beyond, e-IGNiTION was selected to design a new site from first principles. The KMF team was looking for a site that would convey the adventurous spirit of the festival and its participants, and would give users the opportunity to have a look at previous years’ multimedia and sign up for latest news prior to the festival. KMF was also looking for a bespoke online availability and booking system, with online secure payment, for over 750 separate activities taking place over the 5 day festival. Phase 1 of the website was delivered to KMF in October 2008 which gave them an easy to use Content Management System to publish content and news articles. From here the Festival could be marketed and people register their interest. Phase 2 was to publish an online directory covering all the activities that are available during the Festival. We also linked this to the providers of these activities and any sponsors that got involved. This phase pulled together all the aspects of the Festival and it has really made the site useful and informative for visitors. The final phase went live with the activity booking system going online. This was the final piece of the puzzle, allowing people to add activities to their basket and then proceed to the pay through Google Checkout. All this, well in time for the start of the Festival. This case study was posted on Friday, October 24th, 2008 at 2:40 pm.